According to a report from Engadget, Microsoft may be planning to price the Microsoft Surface RT tablet at just $199. I had previously stated that the pricing & OEM impact would be two of the largest challenges facing Microsoft with the Surface launch. Let's take a look at how this pricing strategy affects those and the potential impact it could have on the market. Let me start out by saying that while this rumor may be from an "anonymous source", it does make sense, given Acer CEO JT Wang's recent comments about the negative impact of a $199 Surface RT tablet. It's highly unlikely that he would throw out that price point if it wasn't at least being considered. But enough conjecture; let's assume this pricing strategy is factual and see how it would affect the market. 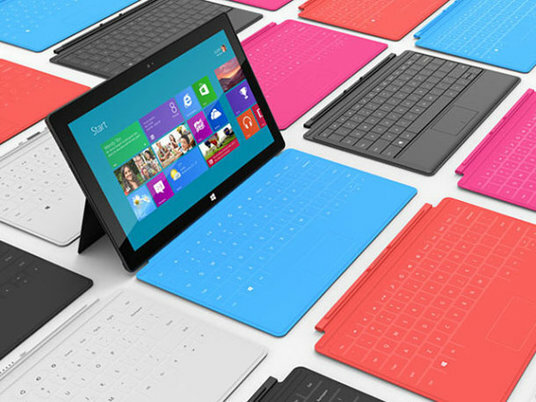 If Microsoft launches the Surface RT tablet at $199, it could be a huge success in terms of sales volume. Microsoft would be setting a pricing bar for 10 inch tablets, in the very same way that the Kindle Fire & Nexus 7 did for 7 inch tablets. The low price and strong brand could help the Surface RT become a hit and could even help it surpass the Nexus 7 in terms of sales volume. ComScore's tablet survey shows that the two most important factors driving tablet purchases is the price and app selection. While the app selection on the Surface RT may be lacking at the beginning, the unprecedented low price would drive purchases and the initial sales burst could drive more developers to the platform. It could take a few years of sales to create an app ecosystem comparable to Android & iOS, but at this price point, that's a very likely outcome. The whole point of a "reference product" is not only to give OEMs design inputs, but to also give them a strategy they can emulate successfully. For example, with the Nexus 7, Google has essentially showed OEMs how to successfully compete in the tablet market against the iPad. Acer has been the first OEM to line up a similar product with the A110 and given the slightly lower screen resolution and Nexus 7's BOM, margins could be around 30%. However, a Windows RT tablet at $199 is not a strategy OEMs would be able to emulate. By launching the Surface RT at $199, Microsoft is guaranteed to see OEMs drop Windows RT tablets like a hot potato. Since Microsoft has not approved any 7 inch designs, the BOM of Windows RT tablets will most likely be very similar to the iPad, i.e. $250-$300. In addition to this, Microsoft would charge OEMs $50-$65 for Windows RT licenses, which brings to total BOM to $300-$350. Microsoft may be able to absorb those losses to drive adoption, but OEMs certainly can't. Since OEMs would be unable to compete with Microsoft on price or brand, the only rational move would be to drop Windows RT tablets from their product portfolio. Once Microsoft launches the Surface RT at $199, it would essentially be setting a price benchmark that it can never breach. Raising prices later would majorly dampen consumer demand and the whole purpose of the initial low pricing would be lost. Microsoft would be unable to keep the price unchanged for longer than a year or launch a Surface RT 2 at a higher price. Amazon was able to sell the Kindle Fire at a low margin because their primary revenue model was content sales. Asus was able to sell the Nexus 7 at a low margin because Google was taking care of marketing & distribution and their long-term revenue model is through growth of advertising on tablets. Microsoft's only real source of revenue from Windows RT would be from OEM licensing fees and device sales. If Microsoft takes a steep loss on device sales and OEMs drop Windows RT products, what exactly is Microsoft's revenue model? The content base on Windows RT is still non-existent and even the $199 Surface RT will most likely not generate enough revenue through content sales to make up for the losses. In any case, for companies other than Amazon, content sales are only "revenue additives" and not the core revenue driver. The only other option for Microsoft to generate revenue would be from sales of Windows 8 licenses to OEMs, but consumers buying Surface RT tablets are unlikely to also purchase a new Windows 8 PC/tablet. I will show the impact of mobile device sales on PCs in an upcoming post, but it is fairly obvious that rising Surface RT sales would have a negative impact on Windows 8 PC/tablet sales. Therefore, by following this strategy, Microsoft would virtually guarantee much worse financial performance from the Windows division. Conclusion - While pricing the Surface RT at $199 may seem attractive to Microsoft, the negative fallout may outweigh the initial benefits. OEMs would drop Windows RT as the pricing strategy is not one they can emulate, which would leave Microsoft with no real revenue model to bank on. Isn't it possible that Microsoft could subsidize the tablet with a subscription model and still make the same amount of money that they do? The question is - what content can they offer? Office is pre-loaded on the Surface RT, so there's no need to buy an Office 365 subscription. I suppose Skydrive, Xbox Music, etc. would work. But is that a viable financial strategy seeing as the majority of Windows users, even the majority of Hotmail users, don't use Skydrive, and only 66 million people have an Xbox (less than the iPad installed base). Anyways, I'd give this price around a 10% chance of actually being true. What do you think? I agree, I think it's very unlikely. Given the fact that Microsoft's content offerings and subscription services for consumers aren't really large scale (apart from office), I don't think they can make up for that kind of loss. And a compulsory office 365 subscription defeats the point of the low price.